INDIANAPOLIS, Oct. 4, 2018 – BioCrossroads, in collaboration with TEConomy Partners, has released a significant follow-up study to the 2017 TEConomy Partners report, The Importance of Major Research Universities. The original study looked at the Indiana impact of the state’s three major research universities—with collective annual research expenditures of nearly $1.3 billion—in the areas of knowledge expansion and innovation; economic development; the enhanced capabilities of human capital; and societal well-being and quality of life. The report found substantial contributions by our state’s research universities to nearly every aspect of Hoosier life. However, it also showed that federal sources represent just 41 percent of the total annual research expenditures for Indiana’s universities, compared to 55 percent on average for research universities in other states that receive federal grants and contracts. 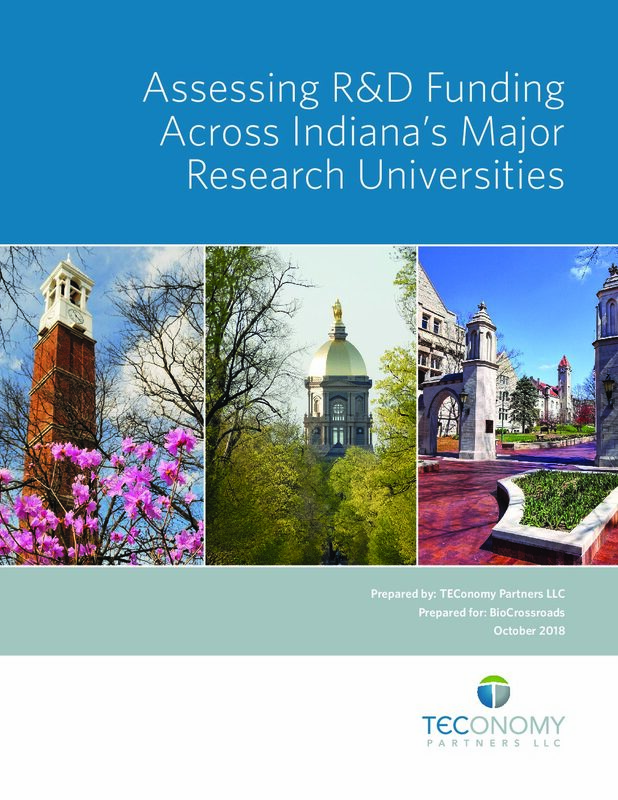 The new study, Assessing R& D Funding Across Indiana’s Major Research Universities, takes a deeper look at the universities’ research and development funding to understand that differential. It also compares Indiana institutions to the top universities in the U.S.; identifies how investments made by the institutions themselves affect federal funding percentages; raises observations relating to the type and sources of R&D funding; and makes recommendations for improvements. While the average of internal program funding for all universities across the U.S. is 28 percent, the rate for the combined Indiana research universities is 36 percent. Overall, each of these universities increased the size of its annual R&D portfolio by $120 million or more over the last decade—a level of combined growth that is outpacing the U.S.
Indiana’s research institutions are successful at attracting funding from a wide variety of sources, and are all performing in the top quartile of research funding for all universities. R&D funding is both a measure of performance and a driver of innovation. Research universities are ranked based on the level of federal funding received on an annual basis and there is a measure of prestige gained from receiving such funding. And, while federal funding represents a significant portion of all R&D budgets, funding also comes from business, state and local governments, philanthropic sources, and other external sources as well as institutional support provided by the research university itself. The Report found that IU’s total R&D spending, federal funding, corporate sponsored research, and non-profit support was higher in total dollars than the average of all U.S. top quartile institutions and the average of all universities with medical schools. Likewise, Purdue out-performed the average of all top quartile institutions and the average of all land grant institutions on all sources of funding, both in total and by source—federal, business, state/local, nonprofit and institutions—and nearly beat the performance for “Other External” funding. Meanwhile, the University of Notre Dame has traditionally been a teaching-focused institution but over the past 15 years has undertaken a deliberate strategy to become a top-tier research institution. Today, Notre Dame outperforms the average of all private research universities for nearly every funding source and, for 2016, gained twice the amount of R&D funding than the average private university. The full report, Assessing R& D Funding Across Indiana’s Major Research Universities, is available at www.biointellex.com, BioCrossroads’ website for reports and educational information.